In these pictures of Agamemnon you'll see some of the episodes in which the Greek king was involved. The following golden mask is a very famous artefact from the Greek antiquity. It is called "The Mask of Agamemnon", even if we can't really know whom it represents. The same mask, with a different lighting. The Greek fleet couldn't sail in order to go to war with Troy, so Agamemnon had to sacrifice his daughter Iphigenia to goddess Artemis (who, in the end, replaced the girl with a deer). 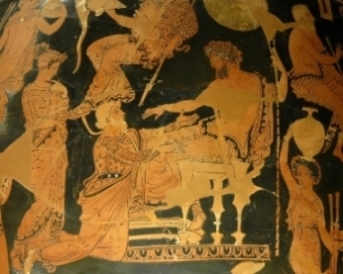 Agamemnon had taken Chryseis as a slave, but he was forced to give her back, because Apollo had sent the plague on the Greek army. After having returned Chryseis to her father, Agamemnon decided to take instead Achilles' beloved slave, Briseis. That's why Achilles was so enraged, that he retired from the battle, and the Greek army started to lose the fight (this is, in fact, the beginning of Homer's Illiad). Zeus had sent Agamemnon a dream, in which he fooled the king into believing that the Greek army was able to conquer Troy. In reality, the Greeks were defeated and they had to beg Achilles to return in fight. Finally, some pictures of Agamemnon fighting in war. He managed to survive the ten years of the Trojan war, but he was killed when he got home, by his wife, Clytemnestra, and her lover, Aegisthus.